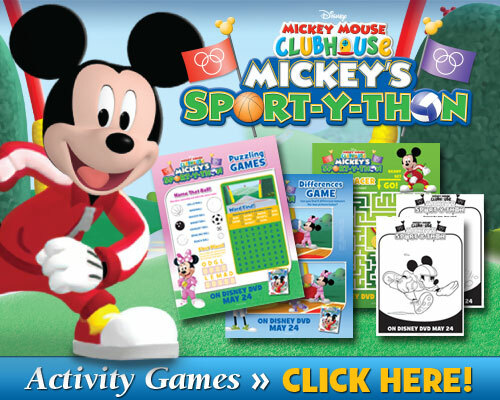 Disney Mickey Mouse Clubhouse: Mickey’s Sport-y-Thon Activity Games! Disney came out with a new Mickey Mouse Clubhouse: Mickey’s Sport-y-Thon DVD for your kids to enjoy! Share the excitement – and a sky-high view of the action – as sportscasters Pete and Donald Duck broadcast live from above in the Sport-Y-Thon Blimp! Who will earn a prized Golden Mickey Medal? Help our heroes discover that with teamwork and good sportsmanship, everybody wins! Jam-packed with over two hours of song-filled fun, Mickey’s Sport-Y-Thon will have you calling for an instant replay! Put on your sneakers and get ready for the greatest sporting event ever! InMickey’s Sport-Y-Thon join referee Goofy and all your Clubhouse Pals from earth and outer space as they compete in wonderfully wacky games. To download, simply click on the photo above and print the pdf! I’d love to add this DVD to our collection. I’ve got one big Mickey Mouse fan over here! Sounds like a lot of fun and a great way to get the kids up and moving, with some singing and dancing, a little bit of everything!! I have downloaded, thanks! Look like great road trip activities! These look fun and adorable!